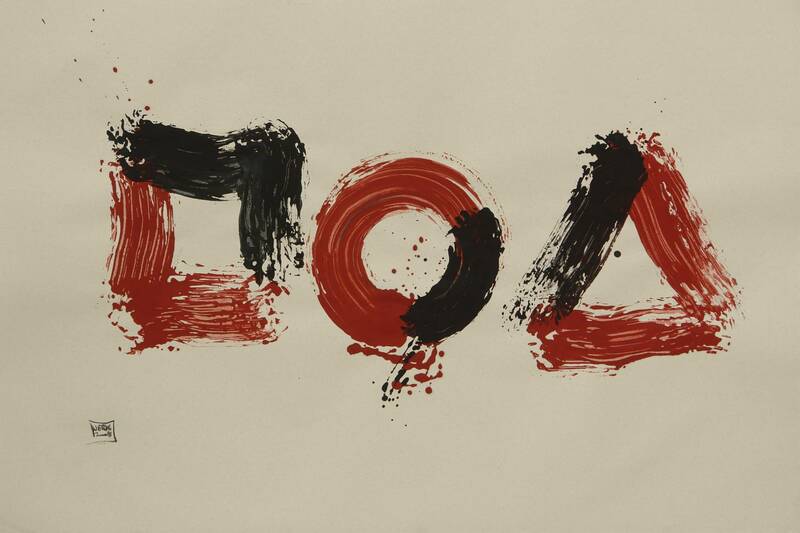 The works of the German artist Thomas Werk are characterized by radical reduction, not only as to what is portrayed but also in the use of artistic resources. Strictly speaking his works are drawings. They are made on paper and only when they are mounted on canvas, they start to look like paintings. On the other hand the artist works most of the time with colour and brush, i.e. with the classical tools of painting. Also his palette is strongly limited: red plays an essential role, supplemented by black and from time to time by a dark blue. 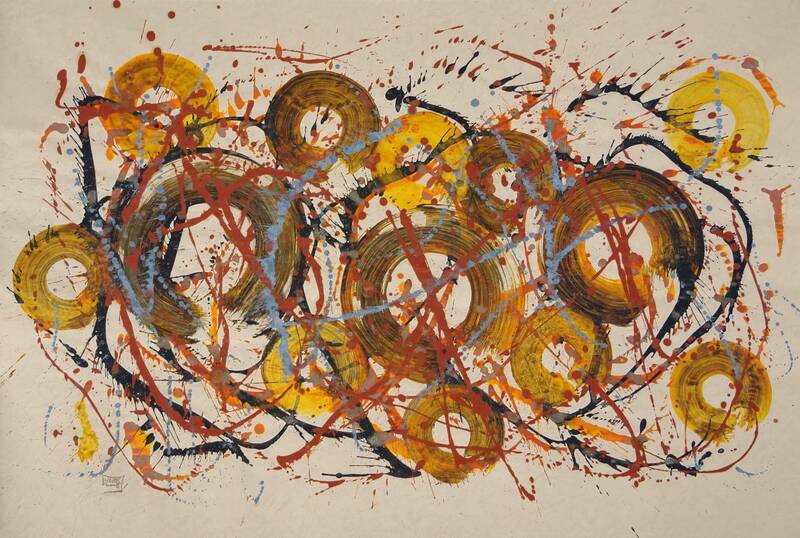 Circles, points and beams dominate the compositions, sometimes swirling shapes appear. Werk furthermore produces delicate calligraphies, made merely with charcoal, like his Psalm Verse or Man of Sorrows. Despite all the formal and iconographical reduction, we tend to see things represented in the works, often even people, even when we have not yet looked at the title. Circles and beams together form larger shapes and compositions. We recognize them as objects, figures, groups: a cross, pilgrim’s staff, table, the Holy family, Jesus, rest during the flight, Pietà, pilgrim. 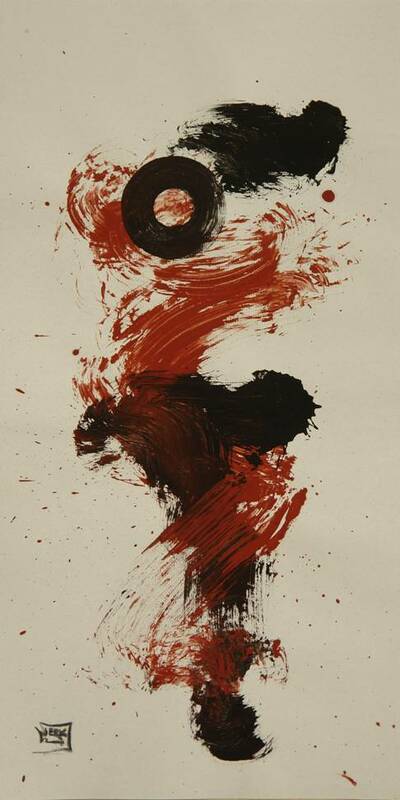 In the swirling forms we discern themes like baptism or resurrection. However, when giving titles like ‘authority’, ‘power’ or ‘prayer’ to his works, Thomas Werk makes use to the same extent of their abstract potential. Often we find the title of a work in microscopically small writing underneath the signature of the artist. The title forms a key to the meaning of a work, even though the forms and composition themselves also invite us to an understanding and reading of the work – reading, as circles, points and beams traditionally are elements of writing; not just of our alphabet, but even more of systems of writing that make use of images as in East Asian cultures. When we look for European influences on Werk’s work, we can first of all point to Art Informel, which after WW II reigned almost supreme. A second major influence is Abstract Expressionism, in which the gesture, the portrayal of the act of painting itself becomes the theme of art. Yet, through reaching back to object and meaning, Werk succeeds in abolishing the alleged contradiction between representation and abstraction. Works by Max Ernst come to mind, whose Grosser Wald (Large Wood) for instance oscillates in a similar way between formal reduction and representational readability. 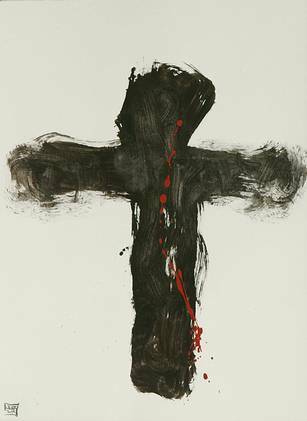 When we think of Werk’s Cross we may even be reminded of Joseph Beuys’ crosses on objects and images. 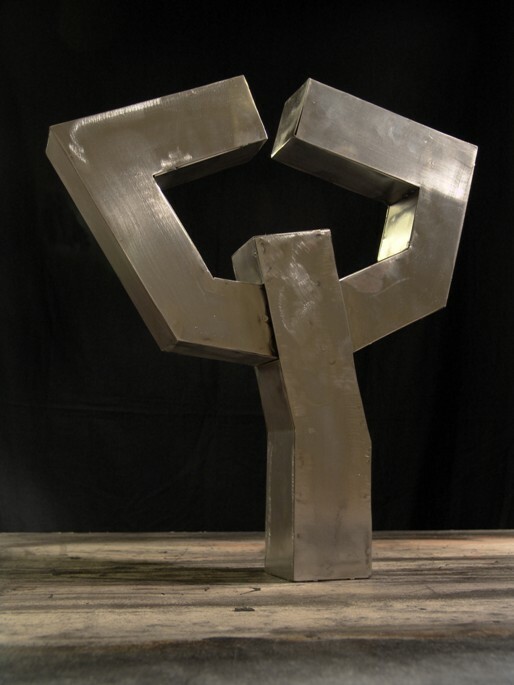 At first glance Werk’s sculptures come across as quite different than his two-dimensional works. They are steel constructions, often with polished and shining surfaces. Their similarity to the paintings becomes clear, however, when we compare the drawings made in preparation for the sculptures to those for the paintings. In the sculptures the same simple forms, beams and circles appear, inviting us once more to read the underlying subject or concept directly from the form and composition. How will Werk’s work present itself in a church space? Maybe surprisingly different than when shown in the sober spaces of the PAX-bank, where it was exhibited before. We can take in the artistic objects from afar and come closer to look at them more closely. In this way the sacred space will gain an added meditative dimension. Thomas Werk (b. 1971) is a German artist who was born and raised in Berlin. He was strongly influenced by the Protestant Church of East Berlin. He studied German literature and philosophy as well as art. Since 1994 he works free-lance as an artist. For more information, see www.thomaswerk.de. The catalogue Bilder und Monumente, Edition St. Matthäus – Berlin, 2009 about Thomas Werk’s work can be obtained for €15,- from the office of the Stiftung St.Matthäus, Berlin or in the St. Matthäus-Kirche, Berlin. Mail to info@stiftung-stmatthaeus.de. Website: www.stiftung-stmatthaeus.de. Bernd Wolfgang Lindemann is a German art historian. He is director of the Gemäldegalerie and the Museum for Byzantine art in Berlin. Since 2004 he is Professor in the Historical and Cultural Sciences at the Freien Universität Berlin.